79cc Super Stock® Head Kit, FREE SHIPPING! Our Products >> 79cc Super Stock® Head Kit, 99-05 FREE SHIPPING! S&S 79cc cylinder heads are intended for stock engines and other small displacement applications. These heads are compatible with stock Harley-Davidson® rocker covers. Must use S&S valve cover gasket kit part #90-4124 with stock rocker covers. They are a very economical performance upgrade designed for use with other performance enhancers and are machined to accept S&S® compression releases. For 1999-'05 Big tins with stock rocker covers. 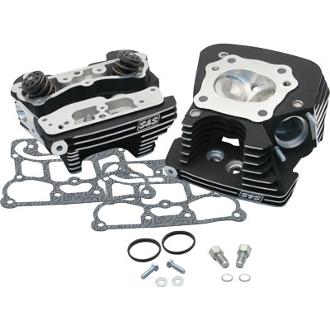 79cc Super Stock® Head Kit, 99-05 FREE SHIPPING!